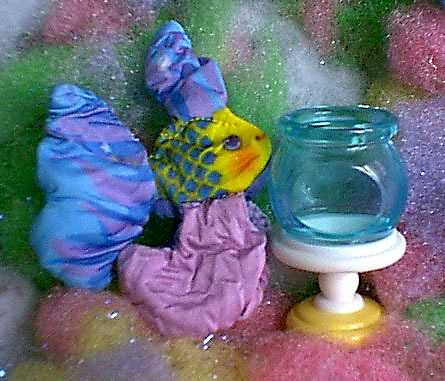 #7259 Smooshees Critter Cuddlers "Squish Fish"
Description: The Squish Fish set includes a Smooshee fish, and a tiny fish bowl that the fish can be smooshed into. This is one of several friendly Smooshee pets called Critter Cuddlers that were sold with a natural habitat they can be smooshed into. Designed for children ages 4 years and older. FPT14939 - Squish Fish - Small stuffed Smooshee fish with a printed face and other features. Fish has a yellow face and body with blue scales on the back part of it's body, and purple on the bottom side of it's body. Fish has blue and purple eyes, orange cheeks, and an orange smiling mouth. Fish has large purple side fins (light purple on top, dark purple on bottom), and a large blue and purple head and tail fin. Fish is not marked with a model number, but was sold with a small sewn-on tag marked with a "S" for Smooshees. FPT14940 - Small round blue-tinted fish bowl with a round yellow base and a white stand. The fish bowl has a round hole in the top and an oval-shaped hole in the side to smoosh the FPT14939 Smooshee Squish Fish inside the fish bowl. Measures 2-3/4" tall, 1-5/8" diameter. Marked "©'87 F-P, HONG KONG" inside the fish bowl.